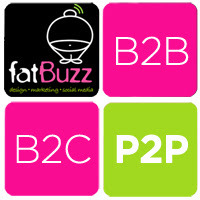 fatBuzz: Are you B2B or B2C when you should actually be P2P? Are you B2B or B2C when you should actually be P2P? I watched a video the other day entitled "Social Media for Enterprise - A Business Case", it was created to help convince senior executives about the importance of social media and Jeremiah Owyang, Analyst at Altimeter made reference to P2P businesses - it was a real ‘light bulb’ moment for me. By P2P he meant “People to People” and what a great reference it is. Those of you who have heard me speak will no doubt have heard me say ‘people buy people’ - I believe this is true for any business whether itʼs B2B or B2C. Furthermore, it applies to all organisations whether in the private sector, public sector or charity sector. Social media is changing the rules; David Meerman Scott, author of New Rules of Marketing & PR, was kind enough to record a video for our New Media Breakfast, and in that video, he talked about how things have changed. He explained that we are all publishers and we can get our message out via social media in such a way that earns us space rather than having to buy space. Itʼs about people connecting directly with people via social media. Likewise, CC Chapman, author of Content Rules and Amazing Things Will Happen, was kind enough to do a video for us in which he said: ‘Be yourself, tell your story and create real content, whether itʼs to increase awareness, increase sales or to get kids to attend your school’. He encourages people to tell their own story and connect with relevant people using whatever social media tools allow them to be themselves. It could be blogging, podcasting, video, or status updates but regardless of the tools, the overriding message was: ‘Be yourself, as if you were there with the person you're talking to’. So, should companies start to think differently? Are you a B2B or B2C business? Or should you become a P2P business? Personally I like the idea; I have always believed in the notion that people buy people, even before social media arrived on the scene. Recently, I have noticed a tendency, particularly in the younger generation, for people to ʻhideʼ behind email and text messages - Iʼm constantly telling people to lift to phone and speak to people, or better still, meet them face to face. All too often people are reluctant to use the telephone to actually make a telephone call! Perhaps by promoting a P2P culture you will help to focus your people on connecting in a much more personal and meaningful manner. Mitch Joel, author of Six Pixels of Separation, uses a very interesting sub-title or tagline for the book: ‘Everyone is connected. Connect your business to everyone’. In the book, Mitch highlights how social media enables everyone to publish content and connect one-to-one, and one-to-many. The video I mentioned at the start of this blog post uses Virgin as a case study and explains how all Virgin staff are encouraged to be involved in the companyʼs social media content; this is a P2P culture. Likewise, Zappos, the American shoe retailer, has empowered its staff to talk to all of its customers, and in doing so, has pretty much rewritten the rules of customer service. Telstra, the communications giant in Australia, has made social media training for its 40,000 employees compulsory in an effort to make sure they are connected and truly P2P. When asked in a recent interview for my predictions for 2013, I said I thought there would be a marked increase in the number of businesses unblocking social media in the workplace. Furthermore, I predict they will not only unblock its use, but they will also empower their people to use it and become ambassadors for the organisation. I truly hope Iʼm right. Perhaps if we redeﬁne our businesses from B2B or B2C and aim to become P2P we will ﬁnd it easier to make the inevitable leap into becoming truly social. If you have found this post interesting please use the share buttons below to tell your online community, there's a good chance they will too. Thank you.